Your eavestroughs and gutters perform an essential service for your home, but they can only do so when they’re clean. 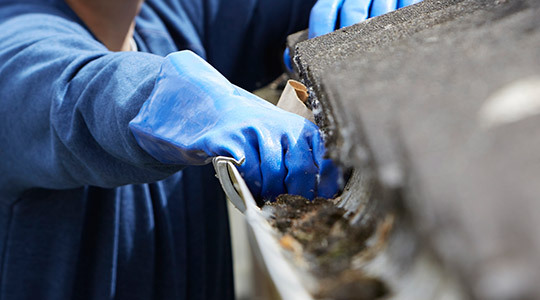 Knowing when they’re filled with dirt and debris can be difficult, which is why you need to have your Brampton home’s gutters regularly cleaned by professionals. When you have clean gutters, you can avoid much of the expensive damages that result from water improperly draining away from your home. NICK’S Window Cleaning has been cleaning gutters for over a decade. We can clean everything, including eavestroughs, soffits, downspouts and fascias. Clean gutters keep water going to the right places. When water overflows or settles in your gutters, the damages can reach from the top of your home all the way down to its foundation. Repairing the damage from these leaks is expensive and time consuming. Our revolutionary scheduling system makes gutter cleaning simple and easy. We can set you up with regular gutter cleaning appointments so that your gutters are always clean and you don’t have to remember to book an appointment. Gutter sealing: Our high quality sealant will keep your gutters water tight, stopping water from leaking into the wrong places and causing expensive damages. Downspout guards: Our guards help direct the flow of water into your downspouts, where it can be taken far away from your home. This helps create more efficient drainage for your gutters and eavestroughs. Flushes: Eavestrough flushes are a form of inspection that pinpoints problems with your gutter system. Once we find the problems, we can seal or replace your gutters to help improve your home’s drainage. Professional eavestrough and gutter cleaning service. At NICK’S Window Cleaning, we deliver an exceptional job on every project; eavestroughs, gutters, fascias, and soffits are all cleaned by hand and with the use of professional tools to remove solid matter such as leaf residue and moss build up. We can also provide post-construction gutter clean up which in some cases requires the use of a special liquid which will dissolve even the toughest stains and residues, leaving your gutters clean and shiny ready to do their job. Professional gutter cleaning services in Brampton help keep your home’s gutters clean and working properly. We recommend you have these services performed every year to help avoid potential water damage. The most common damage that results from unclean gutters is when your eavestroughs fill up with water and start to overflow. This water can seep into roof tiles and soak down into your home’s foundation, leading to extremely costly repairs. The weight of the water can also cause an extra strain on your gutters, which can cause warping and inefficient draining. In the winter, any water caught in your gutters will freeze and expand. This causes your gutters to warp and break, but it can also affect their anchoring points. In some situations, the gutters will fall off the side of your home, leading to more costly repairs. They can even fall on an unsuspecting passerby and causes serious injuries. NICK’S Window Cleaning provides exceptional eavestrough & gutter cleaning services in the Brampton area to both residential and commercial customers, up to our maximum working height of 3 storeys. Our fully insured, highly-trained team of friendly professionals are ready to clear out your dirty, mucky eavestroughing and gutters to ensure that your home looks and functions it’s best. Our goal is to make you a happy customer – we are in the business of building great, long-lasting relationships. Contact us today for your Brampton gutter and eavestrough cleaning needs and discover what makes NICK’S Window Cleaning different from all the rest. Overflowing or clogged eavestroughs put your foundation at risk. Water seeping out from a blocked gutter can leak down into your foundation and cause cracks and other problems. Over time your home’s foundation could shift, crack, or leak all because of clogged eavestroughs. But hiring a professional to clean them will lower the risk of damage to your foundation. Also a professional cleaner can inspect your foundation to see if any damage has already occurred. Damage that is found early enough can be repaired before it weakens the foundation of your home. Because homeowners don’t like to clean eavestroughs often they don’t do a very good job. A half cleaned eavestrough is still a danger to your home. In order to get the best quality results it’s a good idea to hire a professional to clean them out. Professionals know how to deal with anything that might be found in your gutters. They can thoroughly clean and protect your eaves so that your home is protected. If time is of the essence and you know your eavestroughs are clogged it’s best to get a professional crew in to clean them. Clogged eavestroughs can leak and cause damage or they might back up and burst if they are full. It’s better to hire professionals to clean them than pay for a replacement eavestrough because the one you had was destroyed by clogs and water damage. If you know that your eavestroughs are clogged hire a professional right away.